Ravinchandran Ashwin and Mohammed Shami helped India seal an innings victory over Sri Lanka in the third Test at Pallekele to complete a series whitewash over their neighbours on Day Three of the third and final Test on Monday. Sri Lanka were bowled out for 181 in their second innings after managing only a paltry 135 in their first to hand India an innings and 171-run win. A South African bodybuilding champion lost his life after a botched backflip during a competition over the weekend.In a video that has gone viral on social media, Sifiso Lungelo Thabete, former IFBB Junior World Champion in the up to 75kg category, can be seen flexing his muscles as he walks towards the centre of the mat at a bodybuilding competition on Saturday in South Africa. Indian bowlers were seen struggling against Kusal Mendis and Dimuth Karunaratne, as Sri Lanka staged a strong fight back to reach 209-2 at stumps after being asked to follow-on the third day of the second Test at the Sinhalese Sports Club Ground on Saturday. After being bundled out for 183 in the first innings, Sri Lanka displayed great character and fight to get back on track. Cheteshwar Pujara was dismissed early on the second-morning courtesy Dimuth Karunaratne. Ajinkya Rahane continued to pile on the runs before being dismissed by debutant Malinda Pushpakumara. Earlier, India became the only side to make scores above 300 on the first Day of consecutive Tests in Sri Lanka as they ended the Day 1 of the 2nd Test at 344/3. Day 2, IND 442/5 at lunch. Cheteshwar Pujara and Ajinkya Rahane struck scorching centuries each as India attained a strong position on the opening day of the second Test against Sri Lanka at the Sinhalese Sports Club Ground here in Colombo on Thursday. Opting to bat first, openers Shikhar Dhawan and KL Rahul stitched a decent 56-run stand to provide their side with an initial thrust. India won the toss and elected to bat first in the second Test of the ongoing three-match series against Sri Lanka at the Sinhalese Sports Club (SSC) here on Thursday. For India, opener KL Rahul returns into the Playing XI while Abhinav Mukund misses out. Rahul had missed the opening Test as he was laid low by a viral fever. India’s chief coach Ravi Shastri believes that the current lot captained by Virat Kohli has achieved way more than some of the teams of yesteryears which had illustrious names in their ranks. “This Indian team has been with each other for two years and they are much more experienced now. They have already done things that a lot of big names couldn’t do in their careers. Cricket in Olympics means a couple of definite medal prospects for India. But guess who has strongly opposed the idea? India itself. Cricket was last played in the Olympics in the 1900 Paris Games and now the International Cricket Council (ICC) is pushing for a return of the T20 variant of the sport in the 2024 event, likely to take place at the French capital again. 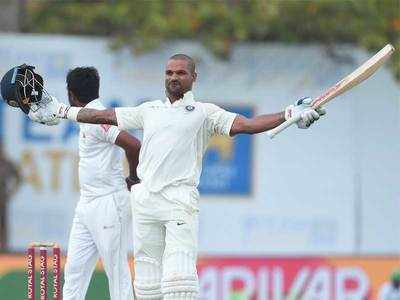 India made a resounding start to their tour of Sri Lanka with Dhawan and Pujara hitting centuries to help their side post 399/3 on Day 1 of the first Test in Galle on Wednesday. Dhawan fell short of a deserving double-ton by 10 runs while Pujara remained unconquered on 144 at the close of play. This is the second highest total that India have posted in a single day of a Test in their history. Virat Kohli hinted that Hardik Pandya may get his maiden Test cap against Sri Lanka. India had lost to Sri Lanka at Galle during the 2015 series when Kohli went in with a combination of five specialist bowlers with a batsman short in the playing XI. However the presence of Pandya, who bowls fast medium close to 140 clicks and is a capable batsman, provides Kohli with the balance that he so aspires.